Supporting the Ouyen United, Sea Lake Nandaly Tigers, Southern Mallee Giants, Walpeup-Underbool and the Woomelang Lascelles Football Clubs. The Speed Mallee Farm Machinery Field Days in conjunction with the Speed Lions Club are again our naming sponsor for 2015. 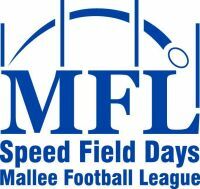 The League is very pleased to be involved with the Speed Field Days and we are sure that through our joint efforts the partnership will be beneficial to the Mallee Football League and also the Speed Mallee Farm Machinery Field Days Committee and the Speed Lions Club. We are proud to have the Speed Lions Club and the Field Days Committee as part of our League in 2015 as we are both very involved in the Mallee area. We look forward to a long and rewarding partnership. The Mallee Football League was formed in 1997 when the former Northern and Southern Mallee Football League merged. The League now consists of five clubs, namely Ouyen United, Sea Lake/Nandaly Tigers, Southern Mallee Giants, Walpeup Underbool and Woomelang Lascelles. Each weekend there are four grades of football - Seniors, Reserves, Under 16s and Under 13s played. The Mallee Netball Association is also played in conjunction with the football and there are five grades of netball - A Grade, B Grade, C Grade, Junior A and Junior B.